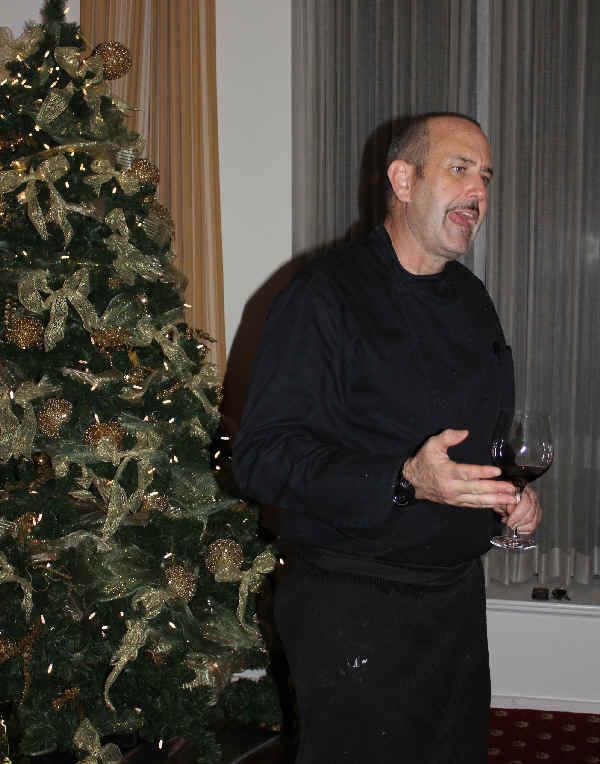 We gathered early in December for the annual holiday season feast and wine marathon. 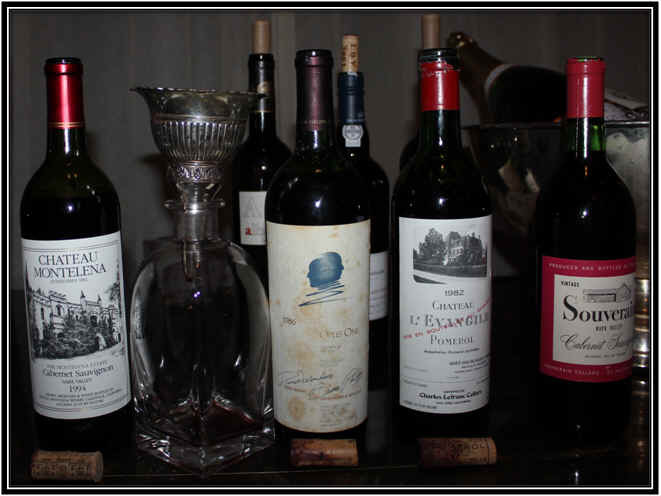 The first order of business was to decant the older bottles and then decant them back into their original (but cleaned) bottle. 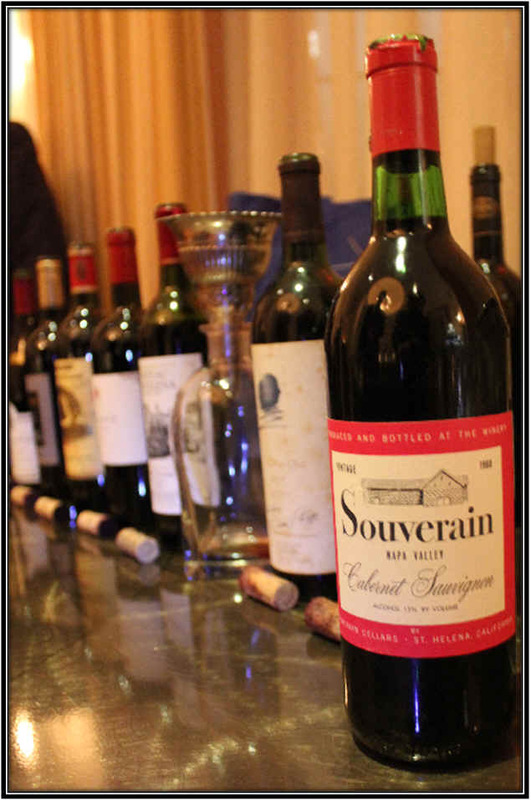 1968 Souverain Napa Valley Cabernet Sauvignon. 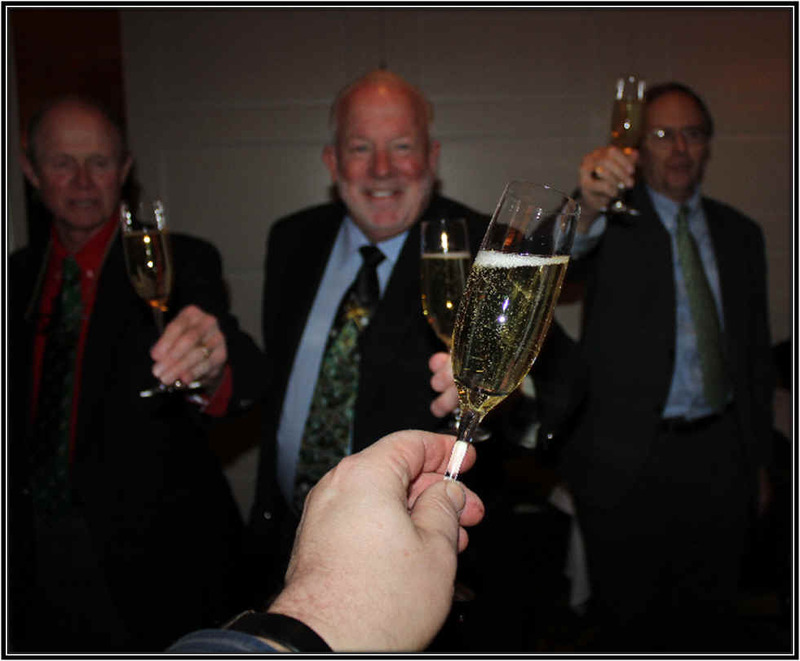 And we had a couple of magnums of Champagne "on ice" and ready to enjoy with the oysters. Moncuit makes its Champagne from one harvest. 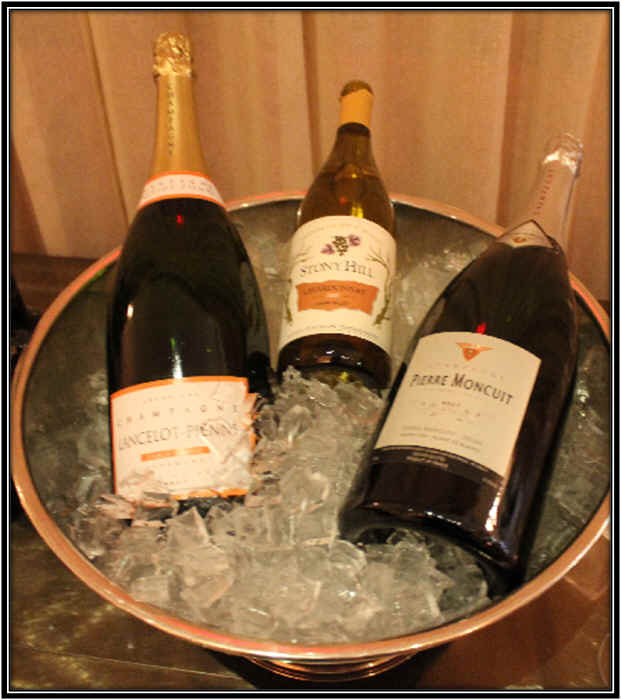 Its bubbly is typically lean and crisp, tart, dry and tangy. 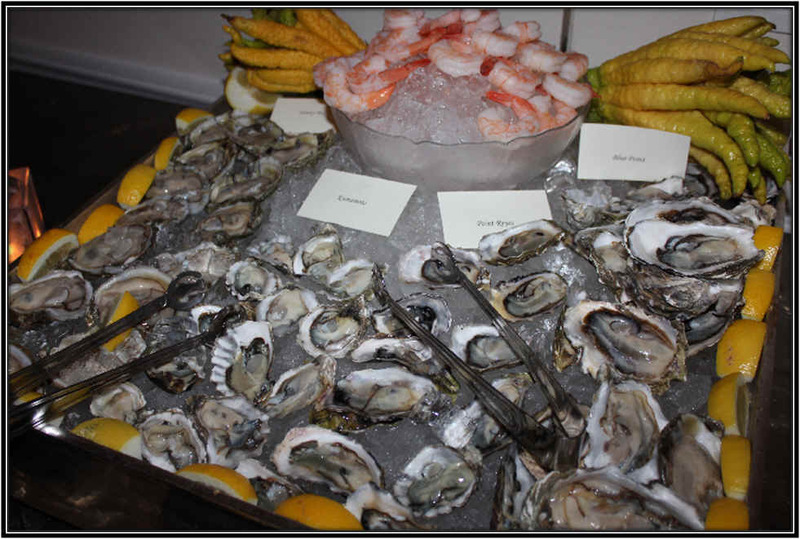 It was very showy with the briny, fresh oysters. 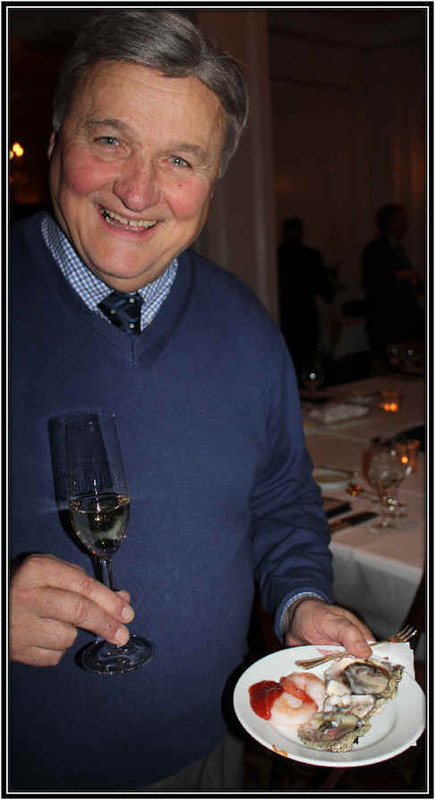 Lancelot Pienne's "Table Ronde" bottling is a blend of several harvests and it's a much fuller and rounder Champagne. The dosage might be a shade higher than Moncuit's, but still quite dry. I found it to be a tad toastier and there was a more creamy texture to it. 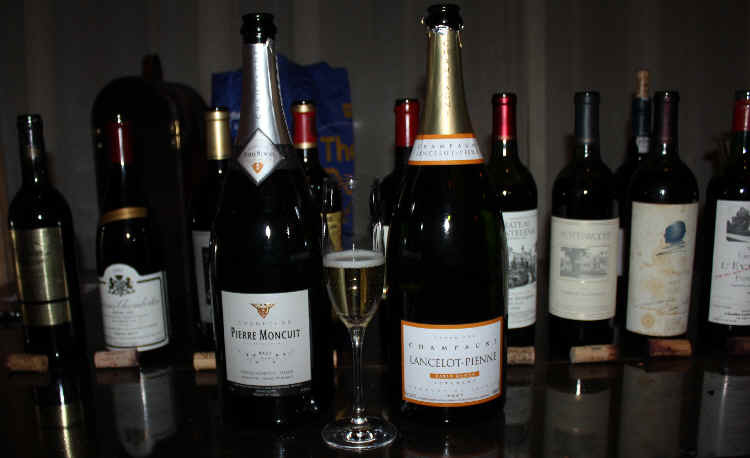 The Lancelot Pienne was also extremely bubbly (you can see in the flute glass...it had been poured minutes before this snapshot and retained a frothy character. 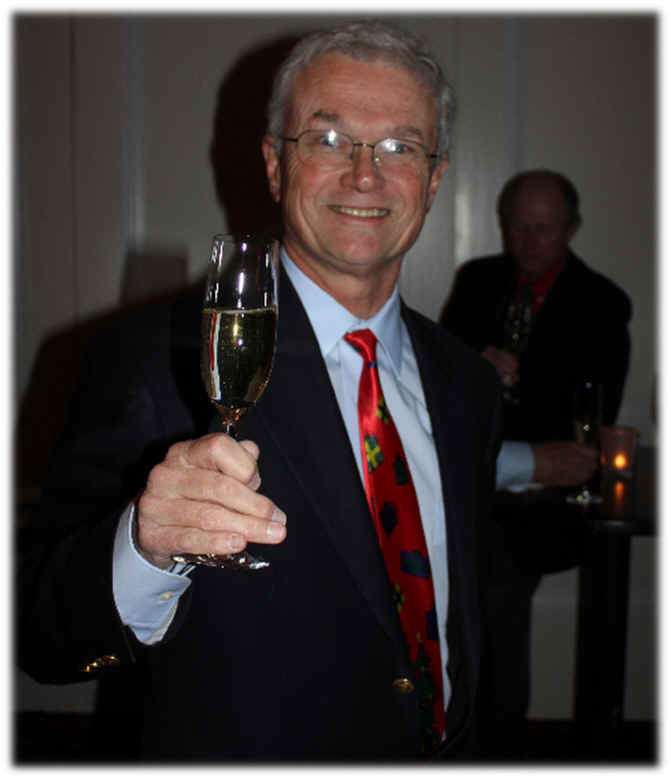 Both were very fine Champagnes. As one Vino Fino member remarked "The Moncuit is so much superior to the ubiquitous Clicquot yellow label, it's not funny." And at this point, everyone found a seat and we began with the feasting! We began with the "John Vignau Memorial Bottle." 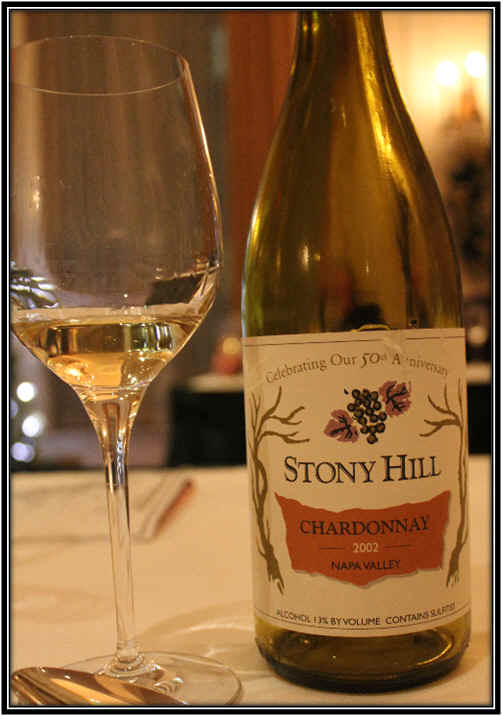 This year is was a very fine 2002 Chardonnay from Stony Hill in Napa, a winery famed for its cellar-worthy Chardonnays. 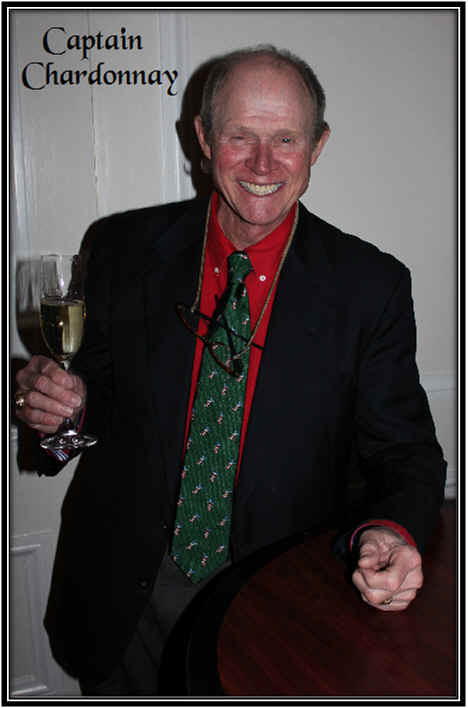 John McGlothlin said a few words in honor of the late Mr. Vignau and we hoisted our glasses in honor of all past Vino Fino members. These Lobster Ravioli were phenomenal! 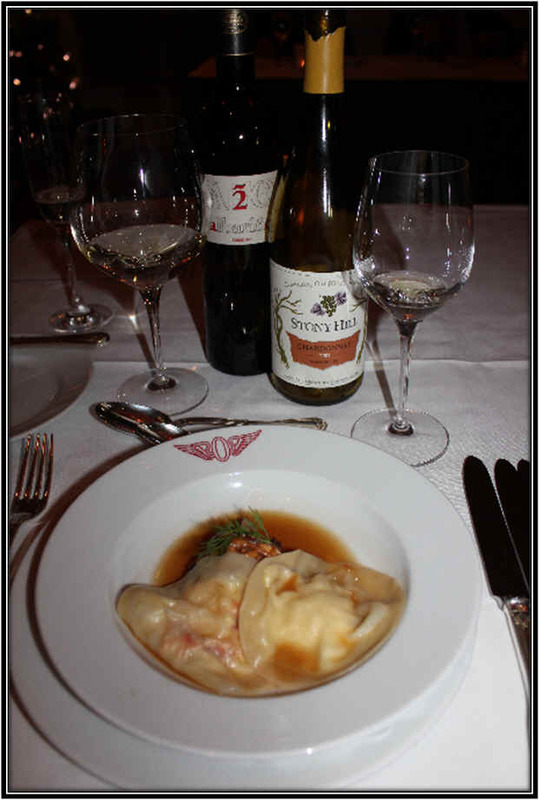 The Stony Hill Chardonnay was nicely creamy and a good match for the Lobster. Also poured was a Castro Martin Albarino from Spain...a lightly spicy, dry, crisp seafood white. 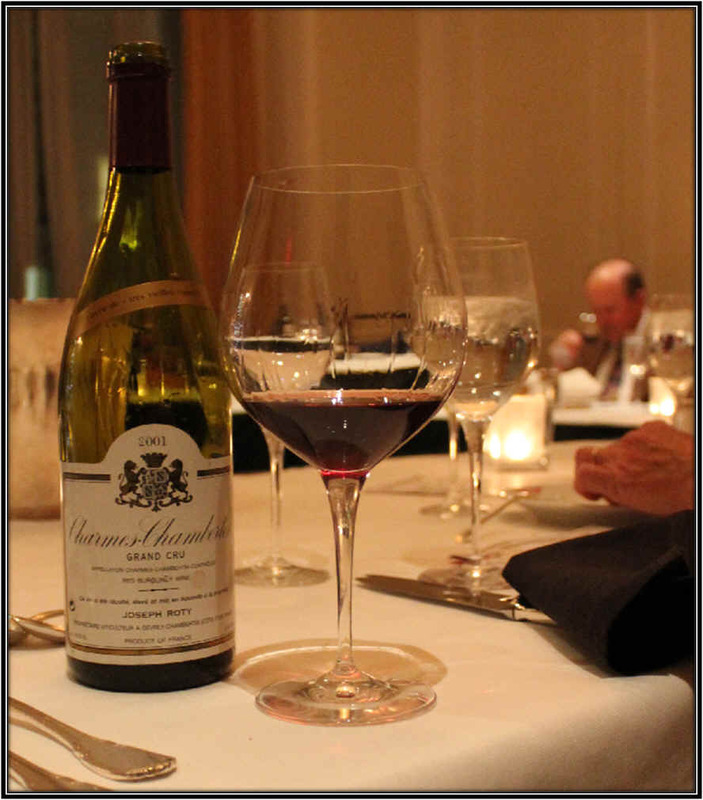 Joseph Roty's 2001 Charmes-Chambertin TVV (damned old vines!) was, for me, the wine of the night. This was brought by David Greiner (who's taking a sniff in the background of this snapshot). This was Burgundy (or Pinot Noir) at its finest. Quail...perfect with the Charmes Chambertin! 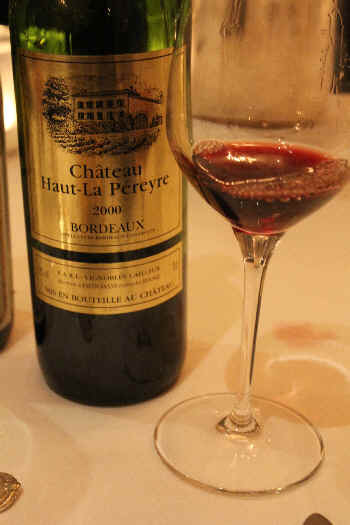 This little Bordeaux is from the Entre-Deux-Mers region...non-oaked...2000 vintage and holding up nicely. 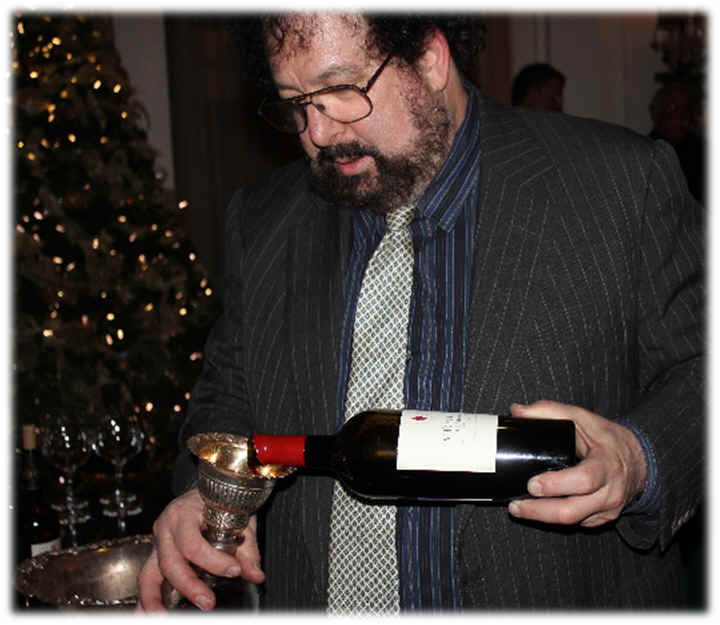 The 2000 vintage of Shafer's Napa Cabernet was quite good. 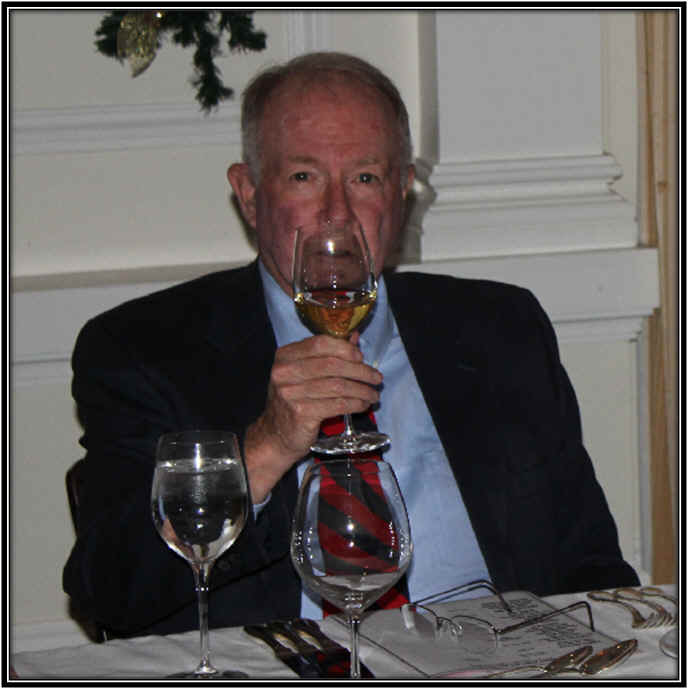 The nose was intensely "Cabernet" in character and perhaps a touch herbal. But this developed most handsomely. There was a hint of a woodsy note, too. It was followed by a 2000 vintage Angelus. The Verite, truth be told, was a nice example of Merlot...straightforward and mildly herbal with a touch of a smoky tone to it. This was soft and smooth...it can still be held a few more years, but it's certainly time to drink this. The 1994 Montelena was a bit funky on the nose...I described it as earthy and showing some underbrush notes. The flavors were okay, but this bottle did not seem to live up to the reputation of the 1994...(and it was not 'corked')...it just seemed a bit disjointed to me. 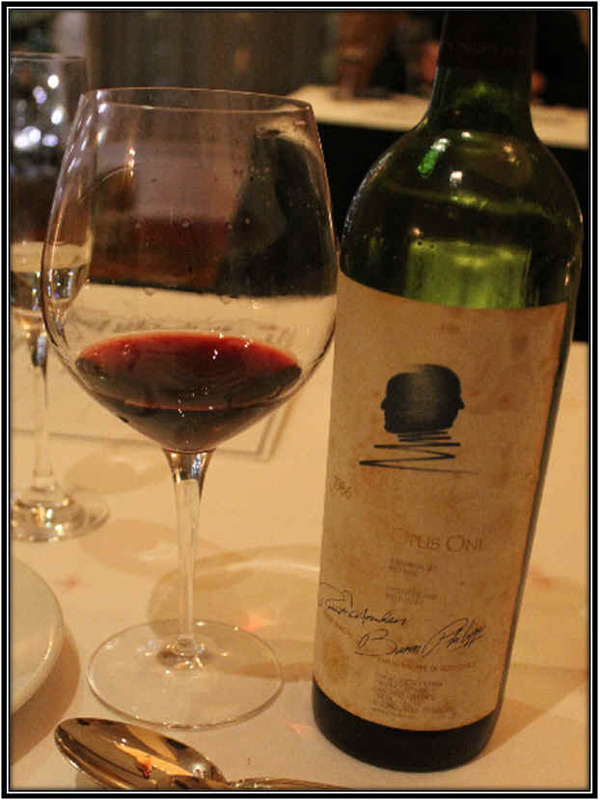 The nose of the 1986 Opus One seemed rather quiet and a bit closed to me. The wine is mildly earthy and woodsy...a good example of a California "Claret," if you will. It is holding up well, but didn't seem as though any further development was likely. But your mileage may vary...perhaps this can cellar well for another decade...? 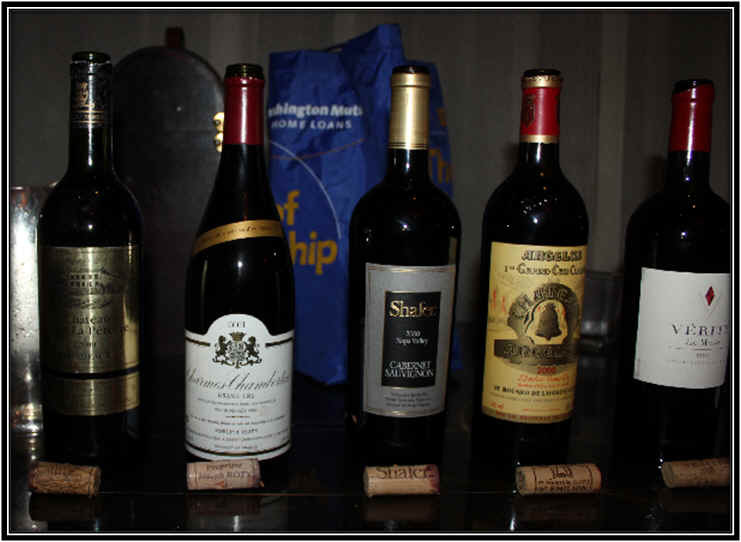 The 1985 Spottswoode was fully mature and showing its age, I felt. Some tasters found a note of licorice in the wine...It was smooth and velvety, as older Spottswoode tend to be, but the fruit had faded a bit. 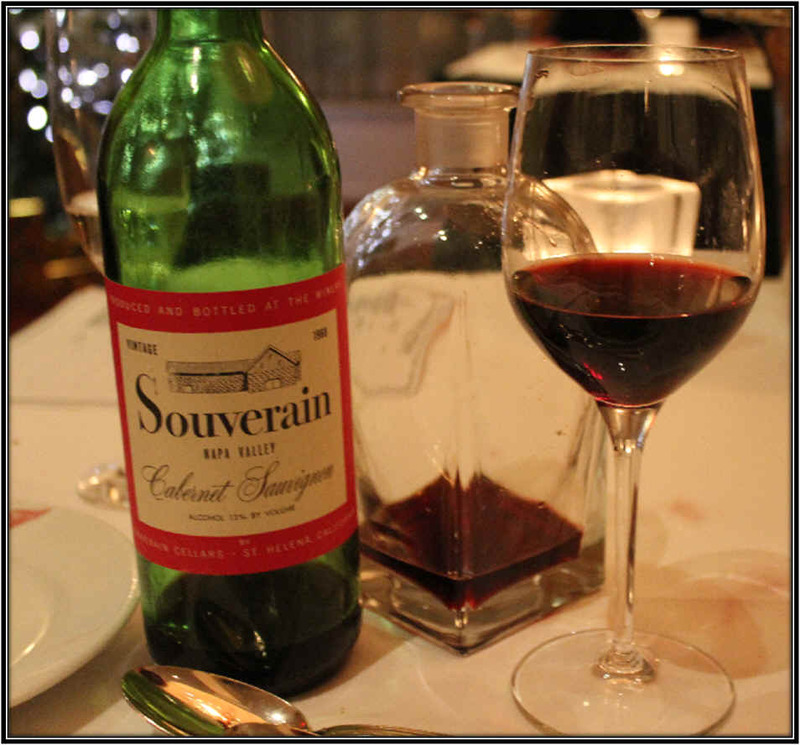 The 1982 L'Evangile was a good, well-aged, mature bottle. It was fully developed as one might expect of a 41 year old Pomerol! There was an intriguing note which struck me as reminiscent, to a small degree, of curry powder. Nice red fruit notes on the palate...very good. 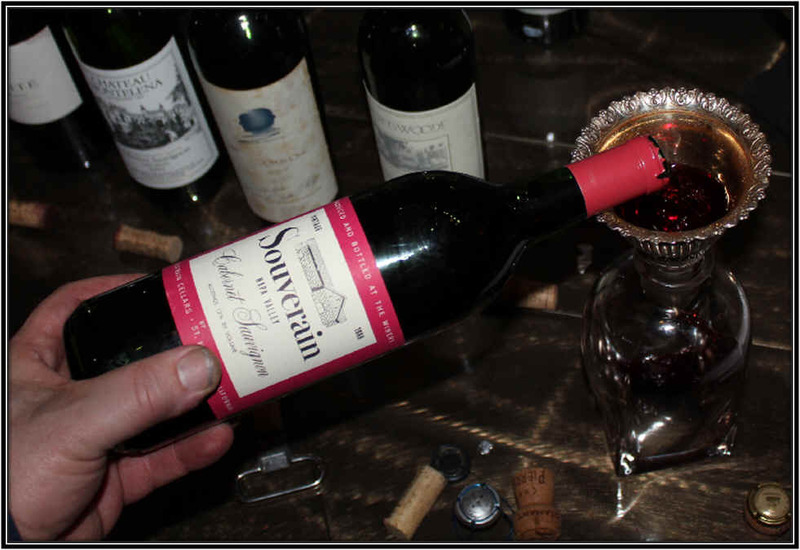 I decanted John's 1968 Souverain at the last minute...not wanting it to possibly fade in the bottle, having been opened and breathing for too long. It's better to wait until the moment of service, typically. 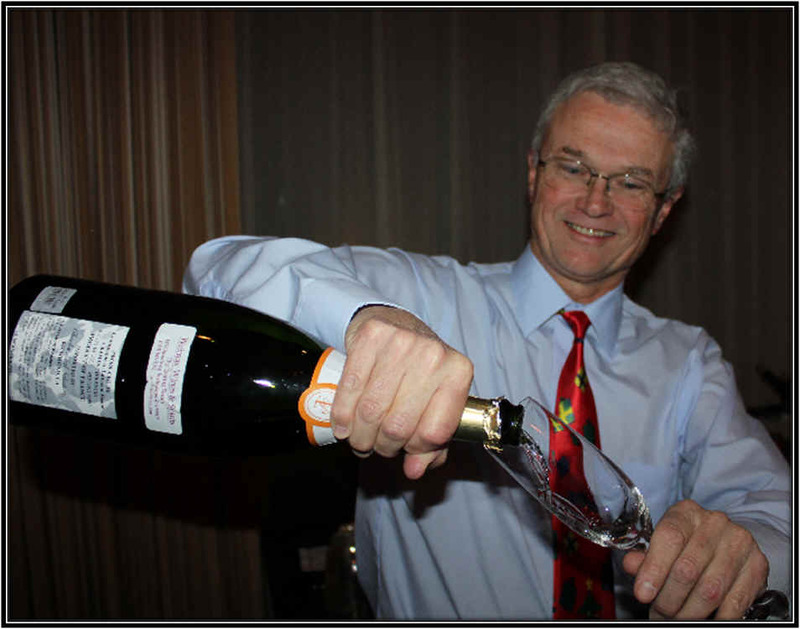 For me it was a corked or funky bottle...I did not find the 'off' notes blowing off with aeration, but intensifying. It was better on the palate, though. People were most curious about the lobster ravioli and Chef Harvey admitted to using won ton 'skins' to make these...and they were awesome! But the lamb had a really good mustard coating...very flavorful! 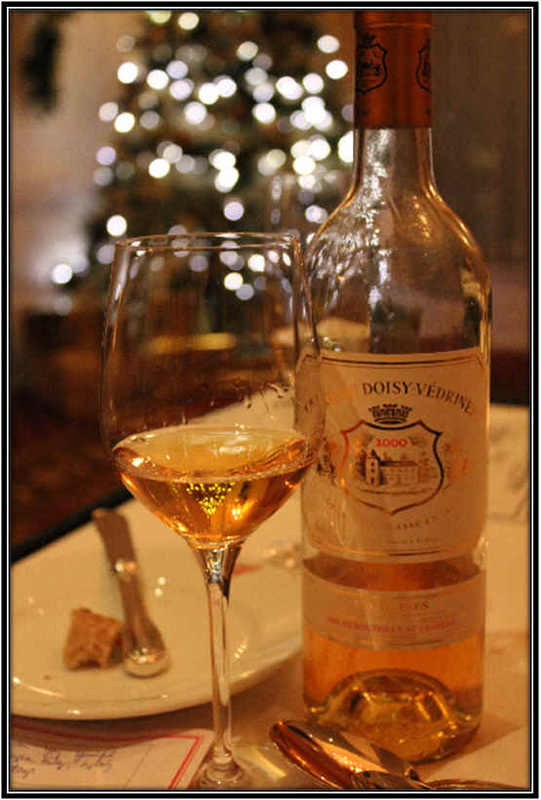 Allan Anderson's bottle of Chateau Doisy-Vedrines from the 2000 vintage was a delight! The wine was honeyed and redolent of apricots...nicely sweet and fairly full, without being heavy. 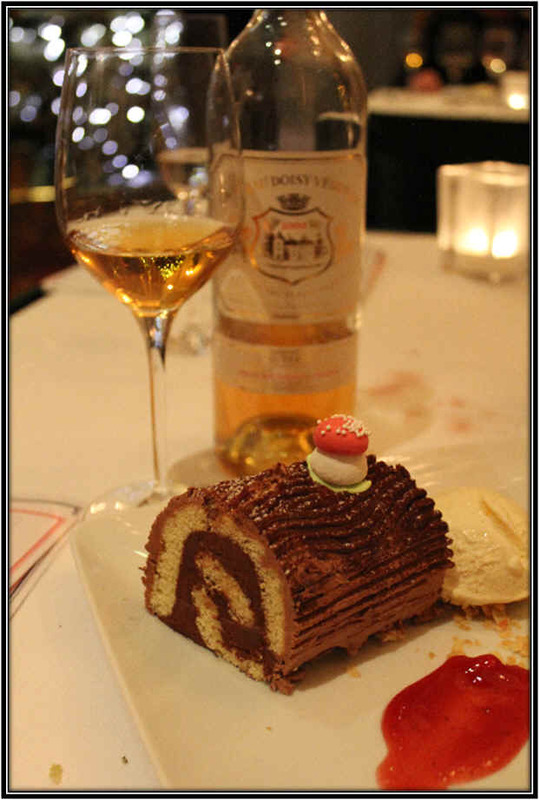 The kitchen sent out a wonderful dessert featuring a "Buche de Noel." We decanted a bottle of Smith Woodhouse 2001 Late Bottled Port to finish off the evening. 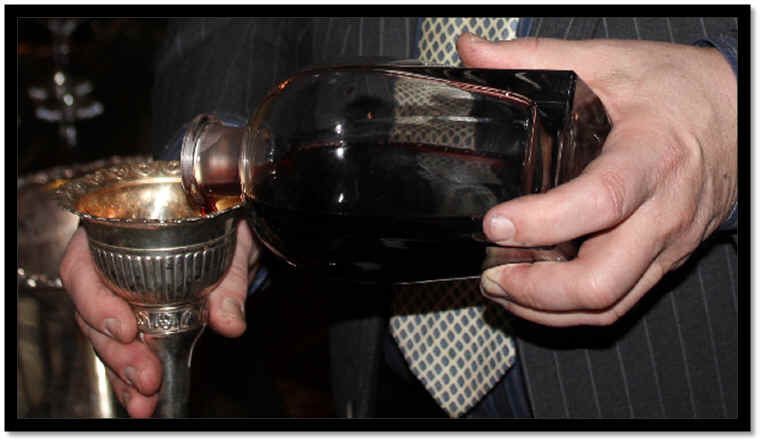 The Port was dark in color and very youthful, in fact, despite 4 years in cask and 7, or so, in bottle! 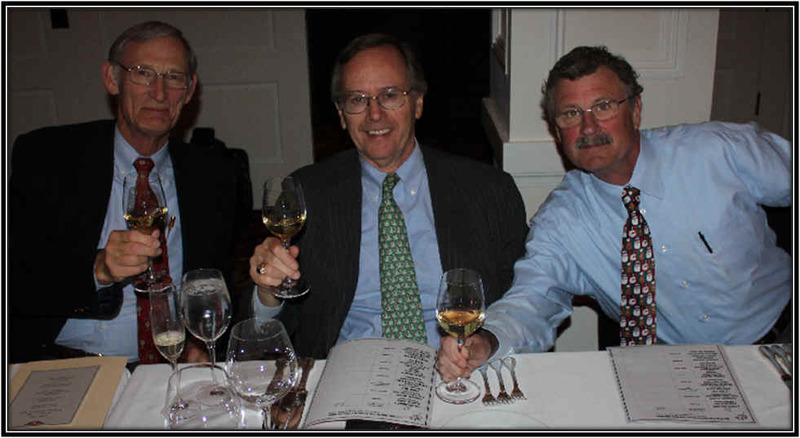 A big THANK YOU to the VINO FINO boys for contributing some nice bottles and to the Olympic Club crew for having us!